NextLOGiK is currently developing a farm food safety software, CompWALK.farm, to simplify the management of farm food safety regulations and compliance. CompWALK.farm is a web and mobile platform developed to better manage on-farm food safety operations and save farmers time. Growers can conduct farm food safety inspections, complete self-assessments, download GAP and FSMA templates and store documents in a single location. CompWALK.farm provides the guidance and clarity to prepare for FSMA and harmonized GAP inspections with alerts and notifications to ensure your farm food safety operations stay on track. 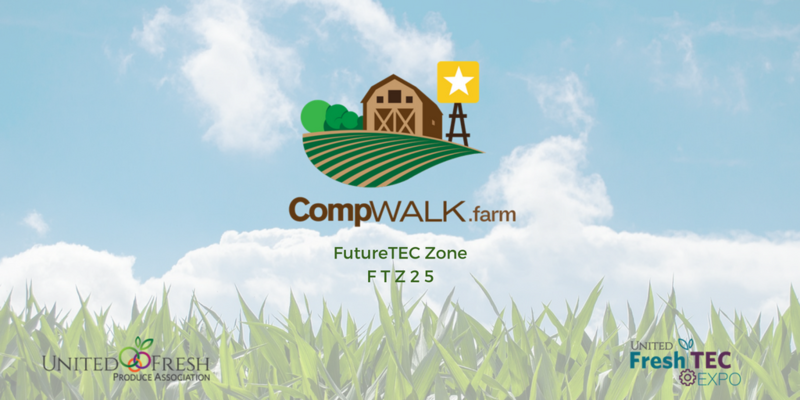 CompWALK.farm will be participating in the FutureTEC Zone at the annual United Fresh Conference held in Chicago. United Fresh showcases the most creative new produce items and fresh food trends, cutting-edge robotics, engineering and technology, business-to-business meeting suites, produce innovation awards and industry-leading education. This year, United Fresh 2017 has been re-branded and focused into two new expos and conferences: United FreshTEC and United FreshMKT. By breaking out the exhibit hall, attendees are able to experience the entire fresh produce supply chain from grower to retailer in a business-friendly environment. The FutureTEC zone, housed within United FreshTEC, offers the opportunity to showcase new and innovative products to be introduced into the produce and fresh food market. We will be showing off our on-farm food safety platform – to be launched later this year – to help farmers and growers better manage food safety regulations, including the FSMA Produce Rule. With FSMA deadlines looming, there is still a lot of confusion around how to achieve compliance under the Produce Rule (and other farm food safety regulations). CompWALK.farm provides a self-assessment tool to better prepare for these upcoming regulations and remain compliant with existing food safety certifications, with best practices drawn from our background in healthcare compliance. CompWALK.farm was selected to speak during the TEC Talks breakout session at United Fresh. This fast-paced pitch-style breakout session is comprised of 16 five minute presentations from FutureTEC exhibitors. The TEC Talks will take place in the FreshTEC Learning Center at Booth #4057 on Thursday, June 15 from 11:30am – 12:15pm. CompWALK.farm will be presenting from 12:05pm. The United Fresh Show will take place from June 13 – 15, 2017 in Chicago’s McCormick Place and you can find CompWALK.farm at the FutureTEC Zone FTZ25.